Was “Sneakers” 20 Years Ahead of its Time? 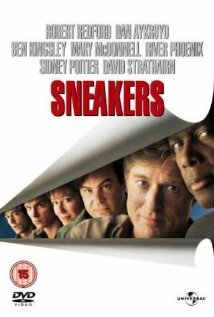 In my ongoing quest to show my wife every movie I’ve ever known and loved, we found ourselves watching Sneakers last night, the 1992 Robert Redford vehicle about a group of hacking misfits who get blackmailed into stealing a codebreaking machine for the government. At least, that’s what they think they’re doing, but it gets complicated fast. It’s a fun, smart movie that never found a huge audience, the kind that would get lost to history if people like us didn’t remember it and seek it out. It’s also on HBO On Demand this month, if you want to give it a shot. I guess the more things change, the more they stay the same. The only difference is that in the movie, what the NSA is doing is against the law. In the final scene, the director of the NSA’s secret domestic spying program (played, in a perfect cameo, by James Earl Jones) buys off Redford’s entire gang in order to keep their information secret. I don’t see Snowden getting the same deal. ← Did Steven Soderbergh Predict the Death of the Political Movie? Just watched it. Wow.. Sad but true.